Staff and volunteers at Samaritan Services strive to help the troubled get back on their feet. There are three levels of services available. Emergency Assistance, to help relieve immediate crisis. Extended Services, for those who require more in-depth case management. Turning Point, for those who are ready to commit to a long-term plan to end the cycle of living in crisis. Emergency Assistance is typically for those clients who have hit a bump in the road and simply need one-time crisis relief. Help may be in the form of vouchers for rent, power/utility bills, propane, gasoline, medical prescriptions and more. Our case managers meet confidentially and individually with each client to best provide resources for each unique situation. When case managers identify a client who requires more in depth case management, our Extended Services program can be offered. 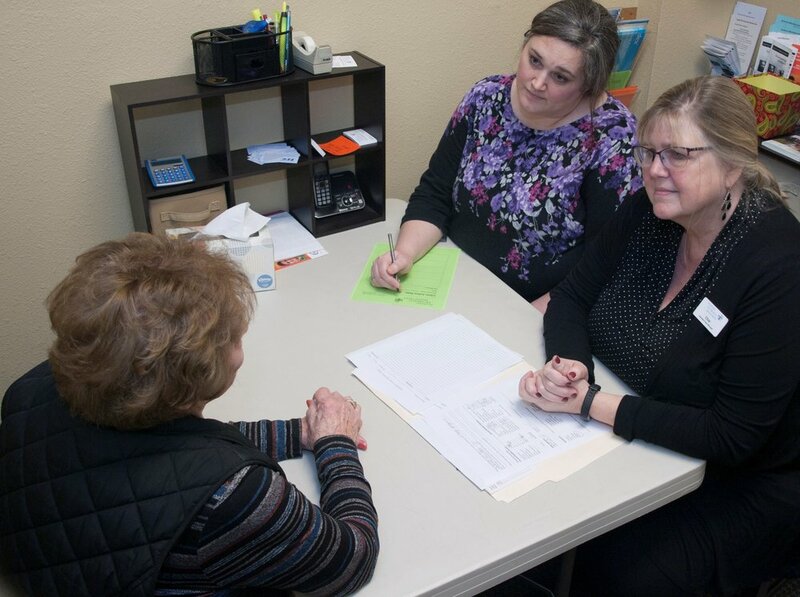 During this program case managers work one-on-one with the client to develop a short-term plan (usually 2 to 3 months). The plan includes goal setting, steps to achieve those goals, and follow up appointments as necessary. Aid is given along with resources for things like job or education opportunities or financial tools for help with budgeting or cost saving measures. Clients who are ready to make a commitment to the changes necessary to build long-term stability are invited to apply for the most in-depth level of Samaritan Services called Turning Point. Sometimes, when clients receive resources but no assistance in exploring those opportunities, they can become fearful. If they have never been able to step outside of what they know (e.g. generational poverty) it can be difficult to have a clear picture of a financially stable life. They’ve never seen what it looks like. Therefore, clients may not know how to work towards stability, which leaves them stagnant, unable to move out of the continual crisis in which they live. Turning Point goes beyond short term crisis relief and targets clients that show potential for making a longer-term (usually 4 -12 months) commitment to change. Along with financial assistance, the Turning Point Program provides individual mentors to walk-along-side these clients and help them navigate through the fear and into long-term stability. At Plateau Outreach Ministries, we partner with many local resources. These include: the Rainier Wellness Foundation’s CareVan, which provides rides to medical appointments, the Multi-Service Center which provides federal energy assistance appointments locally so families don’t have to travel, Valley Cities which provides an onsite counselor during Emergency Assistance, Helping Hands, the Salvation Army, the Enumclaw Senior Activities Center, and Enumclaw Youth & Family Center. Through these partnerships, we are able to extend even more help to our neighbors in crisis. We do not take appointments. Assistance is provided on a first come, first served basis. Bring with you a photo ID and paperwork showing need, i.e. utility shut-off, eviction notice, prescription.